Python and Go are both powerful, high-level programming languages used to write web applications, but Python is relatively easy to learn but difficult to grasp, whereas Go is a difficult to learn but easy to grasp. Python is ideally preferred for rapid development, production deployments, and scalable systems. Python is the future and everyone is moving toward it. An experienced programmer could start writing useful Python code is a matter of hours. One of the best qualities of Python is its consistency. Just work with Python for a while and you’ll be able to start making informed guesses about features that are new to you. Go, on the other hand, is a systems language which is almost as fast as Java and C++ but it takes a bit more time to build things compared to Python. We present an unbiased comparison between the two to understand which one’s better. Python is a powerful, high-level programming language mainly used for scientific and engineering computing. 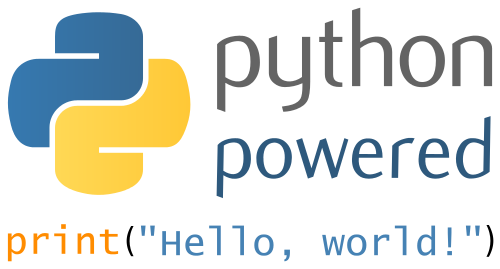 Python specifically refers to the Python programming language and the Python interpreter software that reads source code and performs its instructions. It’s a highly efficient language which is elegant and pragmatic, simple and powerful, and it’s suitable for programming novices and professionals alike. The brain behind the popular programming language is Guido van Rossum who developed Python and released it in 1991. It runs of all major hardware platforms and operating systems and offers high productivity for all phases of the software cycle. Python’s traits are useful in just about any area of software development and one of the best qualities of Python is its consistency. What is Go – Google? Designed by Google, Go is a general-purpose programming language that bears a surface similarity to C, and like C, it is a tool for professional programmers but it is more like an updated version of C. It borrows many good ideas from many other languages while avoiding features that have led to complexity and unreliable code. The language was originally conceived in Sept 2007 by three distinguished IT engineers, Robert Griesemer, Rob Pike, and Ken Thompson, all at Google. By Jan 2008, Ken Thompson had started working on a compiler to explore the ideas of the design: it produced C as output. The design was nearly finished by mid 2008, and was officially announced in 2009. – Python is a multi-paradigm, imperative and functional programming language based on object-oriented programming. It adheres to the idea that if a language behaves a certain way in some contexts, it should ideally work similarly in all contexts. However, it’s not a pure OOP language which does not support strong encapsulation, which is one of the major principles of OOP. Go, on the other hand, is a procedural programming language based on concurrent programming paradigm that bears a surface similarity to C. In fact, Go is more like an updated version of C.
– Python is a dynamically typed programming language which is both dynamically typed and interpreted. It is typed strongly so variables cannot be implicitly coerced to unrelated types as the interpreter keeps track of all variable types. This means we do not need to initialize variables because the type checking is done at runtime. Go, on the other hand, is a static typed language which does not have type inheritance, method overloading, assertions, generic programming, or pointer arithmetic. It’s a strongly, statically typed language which means the type of a variable is known at compile time. – As a programming language, Go is designed to keep things as simple as possible with the idea of creating a simple yet efficient programming language that is not only fast but also easy to learn and work with. Go has rich support for built-in concurrency using goroutines and channels which allows us to build complex concurrent pipelines. Python, on the other hand, doesn’t provide any built-in concurrency mechanism; however, it does have built-in libraries for common concurrent programming constructs – multithreading and multiprocessing. In terms of concurrency, Go is easy to work with as compared to Python. – Python is a multi-paradigm programming language, the traits of which are very useful in just about any area of software development. It offers high productivity for all phases of the software life cycle: design, analysis, coding, prototyping, testing, debugging, documentation, deployment, and so on. It is ideally used for developing both desktop and web applications. Go is more like a systems language which runs directly on underlying hardware. Go is really good at stand-alone command-line apps and web servers. It is ideally preferred for writing reliable and robust programs for large, distributed systems and highly scalable network servers. Python code is faster but the probably of running into silly errors is a little higher. Go, on the other hand, is more like a systems language that is quite similar to C and like C, it’s a tool for professional programmers. However, it takes a bit more time to build things as compared to Python. Python provides a unique mix of elegance and simplicity which makes it easy to learn and one of the most preferred first languages among the community. Go’s approach to data abstraction and object-oriented programming is unusually flexible which makes it well suited for large, distributed infrastructure like network servers. It is also used in a variety of other domains such as graphics, mobile applications, and machine learning. Sagar Khillar. "Difference Between Python and Go." DifferenceBetween.net. 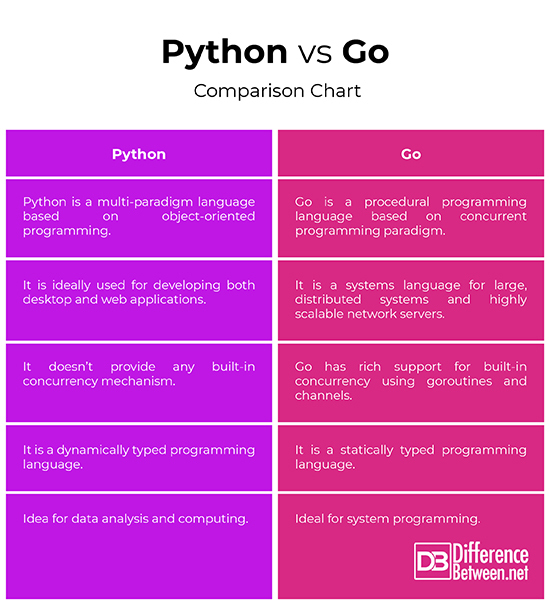 March 5, 2019 < http://www.differencebetween.net/technology/difference-between-python-and-go/ >.